This card cannot be Normal Summoned. This card cannot be Special Summoned except by sending 3 face-up Trap Cards from your side of the field to the Graveyard. Increase the ATK of this card by 1000 points for each Continuous Trap Card in your Graveyard. Once per turn, you can destroy 1 Set Spell or Trap Card on your opponent's side of the field. Spell and Trap Cards cannot be activated in response to this effect's activation. Uria gets 1000 points for every Continuous Trap in your graveyard. So at minimum we have him at 3,000 so we don't need to worry about him being taken by battle. He also has SOME S/T protection as he can destroy (and prevent the chaining of) one S/T per turn. However, a smart opponent can work around this by either setting multiple S/Ts that can deal with Uria or just destroying it with a Spell card on their own turn. As for humorous moments against playing this card like Drillroid would do yesterday: Skill Drain. Run over their 0/0 Sacred Beast and laugh in their face. Dawnyoshi See Wednesday’s review and apply it to today. Today’s card is the least sucky of the three Sacred Beasts, but it’s still really bad. Dark Paladin Today we'll look at Sacred Beast #2, Uria, Lord of Searing Flames, whom I believe to be the worst of the three. Unlike yesterday where you need to send three continuous Magic cards, you need to send three continuous Trap cards to the Graveyard here. Then, you only have a 3000 atk. monster who still has a whopping 0 defense. Although it gains 1000 atk. if you manage to send anymore continuous Traps to the Graveyard, and can destroy an opponents set Magic or Trap card unchained, this monster is terrible...sorry. 1/5, even in its own deck. I don't believe the investment is worth it. Reasoning could easily be teched in his deck to give him a quick boost. In fact that is the basis of a difficult OTK. It involves gettinr Uria to the hand and using Reasoning to get enough Traps in the grave so that after he is summoned he is at 8000. Then using his effect to clear the what is likely their only backfield card, attack for the win. It could be fun, but is in no way stable. It’s not something you would consider running seriously. His effect though is simply awesome, you actually get some benefit from him. He has a triggered effect, which means you get priority, and it lets you kill a set backfield card. But if that wasn’t enough, the opponent can’t chain any s/ts. This would mean that the opponent would miss the timing for torrential and bottomless, something very nice. That combined with the fact that you can use it every turn means that if you keep him alive you are in good shape. All in all though, he costs too much to be effective. He will die just as easily as his brother, meaning that you will lose card advantage. Thanks to this he essentially becomes a card that is once again suited only for fun play. But he is the best of the three, and using a deck the focuses on him would be your best bet. Better, but worse, than yesterday's card. Better in that you can blow up a s/t (making a 1-4-2) and say "Screw you!" to chainable cards, Torrential, and Bottomless (always use the priority on the summon and your opponent can't chain TT). She's worse in that her summoning is much more difficult. There aren't as many good continuous traps one would want to destroy. Perhaps Wall of Revealing Light and Chain Blast. Still, though, interesting. If you have a beard, you should scratch it now. Ahhh, my favourite card ever printed I think. 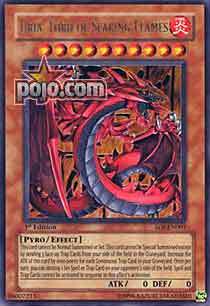 GX’s answer to Slifer, my favourite of the Gods. Uria is a card that I only recently made a deck out of, and upon which I discovered Uria’s true power. Of the 3 gods, Uria is the greatest, being searchable, less prone to trap cards and capable of the highest potential attack. Uria’s s/t destruction effect is what makes him so effective, being capable of destroying one spell or trap each turn and not allowing for that card to be activated, as well as the effect being negated. Sweetness. Again, Uria’s downside is his difficult summoning requirement ,having to sacrifice continuous traps and the fact that he is vulnerable to monster removal, the same as any other monster. Fortunately for Uria, his greatest weakness could also work in his favour thanks to a very special and over looked card - Anti Spell Fragrance. This is a continues trap card that forces both players to set spells before they can activate them, thereby helping either Uria’s summoning, or creating an effective lock by utilising both these cards together. Traditional (in my Uria deck) - 2.5/5 Weakened, but effective. Advanced (in my Uria Deck) - 4/5 Powerful, very powerful. Did you know why Chuck Norris sleeps with the light on? This is my favorite thing SOI offers. Uria, Lord of Searing Flames a 5/5 in any deck which meets his requirements. Honestly after one turn being on the field, he destroys a set card, a monster, and then forces your opp. to act. Hence his summoning requirements are met right from the start. I love him, I love him. Anyone who tells you this card is not playable, is just jealous becausae they don't got one:P you just have to meet his summoning needs, but honestly, royal decree, gravity bind, EOA, etc. all these cards are continuopus traps. And all of them surve numerous purposes. If you get this thing, try it out. It is because the Dark is afraid of Chuck Norris. Yes, I wrote reviews for the other cards this week. I just didn’t get them in on time. They should be up now, though. Stats : Uria, Lord of Searing Flames is a Level 10 Monster, but once again it’s a nomi so the Level is rarely going to matter. It is a Fire/Pyro Monster, a combination with some very limited Support, some of which is incompatible with the nature of Uria. At least it is something. Uria has a base ATK/DEF score of 0, allowing it to be searched out by Sangan… and telling us we need to move onto the Effects section. Effect(s) : First, the only way to get Uria, Lord of Searing Flames into play is by sending three of your face-up Trap cards to the field. It’s the “face-up” restriction that really hurts, since Continuous Traps are about all you can make use of, it slows this Monster down a tad, and it makes it harder to combo the card. The second effect determines Uria’s ATK: it increases by 1000 for every Continuous Trap in your Graveyard. That means you will probably have a good 2000-4000 ATK Monster on your hands, which is nice, and if Uria comes out late enough, it can be very large indeed. The third and final effect is that once per turn you can select an opponent’s set S/T and nuke it. What makes this actually worthwhile is that they aren’t allowed to chain, and if you immediately choose to activate the effect after you Summon Uria, then they won’t be able to activate Traps that respond to Uria having been summoned (like Torrential Tribute) because the timing was missed. This effect is what probably makes the card a bit more playable, since it gives it a good shot at actually surviving long enough to launch a killing blow. Combinations : Gravity Bind can be good for stalling until Uria shows up, and Embodiment of Apophis is a good way to block opposing attacks. Both can then be used to get Uria into play. Be sure to include Card Destruction some Emergency Provisions since, once Uria is in play you want an easy way to send several Continuous Traps to the Graveyard (and benefit from it in more than one way). Sadly, we lack some useful cards that are out in Japan that really would make this deck: Metal Reflect Slime and Red Gadget Stronghold are two more “Trap Monsters”, and while they are basically total defenders (each have 0 ATK and 2000 or better DEF scores) that’s kinda what is needed here. Traditional : 1.5/5 – Scored with the assumption you are using it in its own deck. As usual, it’s just not good to use a card like this here: even being able to disarm some of the nastier Traps won’t keep it alive more than a turn. It is nice that it can use Painful Choice and Graceful Charity. Advanced : 3/5 – Scored with the assumption you are using it in its own deck. If we had some of the cards available to the Japanese, it would probably be more worthwhile. Limited : 1/5 – I don’t believe there are any Traps that remain in play face-up after activation in this set, so there wouldn’t be a way to Summon it. Oh so close to being something that could see some major play, or at least a substantial amount of minor. Like yesterday’s card, it can win, but I wouldn’t expect it to win much in even a moderately competitive tournament. Still, it’s better than it’s sibling from yesterday, though the scores may not show that.